Maldives' renowned construction tycoon Mohamed Ali Janah has been sworn in as the president of the International Federation of Asian and Western Pacific Contractors' Association (IFAWPCA). Speaking during IFAWPCA Convention held in Kuala Lumpur, Malaysia, Janah who is the Chairman of Hotels and Resorts Construction Pvt Ltd called upon all associates of the member countries on the importance of empowering the youth entrepreneurs, recognition of human rights by the employer and urged delegates to strive together to achieve their main goals. Addressing over a thousand guests who attended the colorful ceremony, the seasoned businessman proposed to facilitate the formation of an investors club which can mediate investment opportunities between member countries. Janah also serves as the Chairman of Maldives Building and Construction Board and is also a Board Member of the Maldives central bank, Maldives Monetary Authority. He has previously served as the President of Maldives National Association of Construction and as the first Vice President of IFAWPCA. Under Janah’s presidency, the next IFAWPCA Convention is to be held in the Maldives in 2020 and an estimated 1,500 delegates are expected to attend. While the possibility of fitting that many delegates into one conference is hard to picture, the members of MNACI board expressed confidence in Maldives' capacity to host such a mega event. 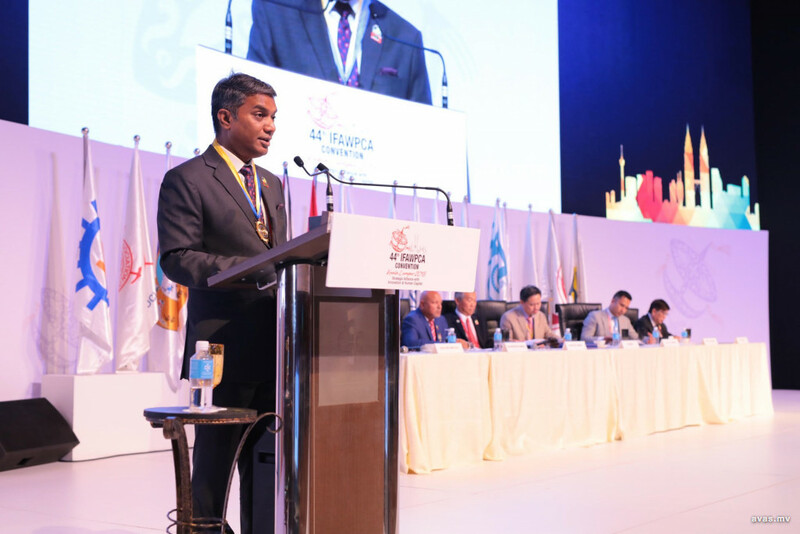 During Janah’s tenure as IFAWPCA’s president, the position of Secretary General would be filled by Abdulla Mohamed while Alau Ali would be representing Maldives on the IFAWPCA Executive Board.